It must be said you have to live in a fairly strong signal area for a set top TV aerial to work reliably, in fact in some ways the fact a house can get a decent signal from a set top aerial is the definition of it being in a good signal area ! But, after the 2009 to 2012 digital switchover (when transmission power went up greatly), there are a significant number of areas which fall into that very category. The good news ? Well there are actually quite a few places were indoor / set top aerials will work, though, it must be admitted, they`re very much the minority. Also, the most effective set top aerials are the little Yagi types and they are the cheapest, usually much cheaper than some of these fancy looking thingamy jigs. But there`s more, oh yes. 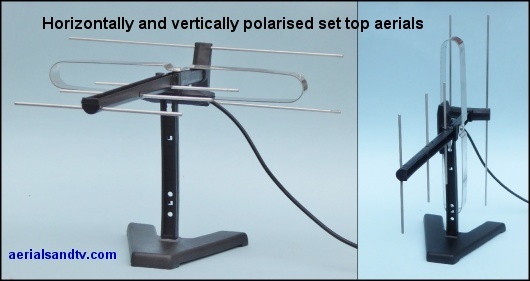 A signal`s polarisation is important, for maximum reception the aerial has to be the same polarisation as the transmitted signal, specifically horizontal or vertical. It must be admitted this can be less important for a set top aerial because the signal is often being bounced about all over the place and may be cross polarised anyway. It may even be that different channels (frequencies) have differing polarisations because their wavelengths are be slightly different and therefore the signals behaviour inside the room won`t be the same. This is one of the many reasons why the best signal will often vary for different channels though this was far more easily seen with the old analogue signals. Anyway, panel aerials cannot generally be polarised for vertical or horizontal signals. The above graphic is pretty self explanatory, basically if you amplify a small poor quality signal all you`ll get is a bigger poor quality signal….. However, that`s not the end of it, because it is in fact possible to have too much signal, and that will usually give the same “no / poor signal” message on your TV or STB so you wouldn`t even know it ! Thus is could be the case that you live in a strong signal area and the set top aerial`s built in amplifier is amplifying that to give excessive signal, we would never sell any aerial of any type with a built in amplifier (which cannot be switched off / bypassed), because, to be frank, built in aerial amps are a stupid idea. Actually, because set top aerials, particularly panel types / omni directional types tend to give a poor quality signal it is perfectly possible to have a signal which is of insufficient quality and at the same time be too big for the TV`s tuner to cope with ! So why are amplifiers sold ? Well the cynic in me would suggest that most retailers will just sell what the public wants to buy irrespective of whether it`s actually any good. But, more positively, amplifiers can sometimes be necessary when supplying multiple points and/or sending a TV signal down a long length of cable. Having to align an aerial for best reception can be a bit of a pain (particularly if you have to realign it to get the best reception on different channels ! ), but an omni directional aerial, one that picks up from all directions, is seldom the answer. Why ? Well the amount of signal collected by an aerial (its “gain”) is greater if its acceptance angle is smaller, one is a function of the other, thus, obviously, an aerial which accepts signals from all directions (and both polarities, see above) cannot pick up as much signal as a directional type. Furthermore an Omni`s acceptance angle (or beam width, to eliminate unwanted signals), is, well, 360° ! Obviously the best place to put an indoor / set top aerial would be in the window of an upstairs room facing the transmitter (but that`s not always possible ! ). Conversely, the more walls you have between you and the transmitter the worse the signal will be and, because no RF signal can be received through conductive sheeting, the effect will be that much worse if the wall(s) has foil backed cavity wall insulation. Generally speaking signals from rooms on upper floors will be better than for rooms on lower floors. Indoor aerials are more susceptible to picking up interference from domestic devices (e.g. cordless phones) than outside aerials, or even loft aerials, because they`re low gain antennas and, in addition, they`re tend to be nearer the source(s) of the interference. Amplified aerials are even more likely to pick up unwanted interference, particularly if they`re unshielded, which, in a cheap set top aerial, they may well be. As stated above it may even be that different channels (frequencies) will picked up best at slightly different positions within the house (or even the same room) because their wavelengths will be slightly different and therefore the signals behaviour inside the building will vary. This was far more easily seen with the old analogue signals. Which type of set top TV aerial is recommended? Which type of set top aerial is recommended ?